Offering a spa & wellness centre and a fitness centre, the Rallye also has an express check-in and check-out feature and family/oversized rooms. This 4-star hotel is a short stroll from Ronda's lively nightlife. Amenities at the Rallye include a coffee bar, meeting rooms and massage services. Family facilities include babysitting / child services. The hotel operates a well-equipped business centre and also offers conference facilities. The Rallye offers contemporary and comfortable rooms equipped with a hair dryer, cable / satellite channels and a mini bar. A telephone, a private bathroom and heating can be found in each room of the hotel. To make sure your day gets off to a good start, the hotel provides a buffet breakfast every morning. Mediterranean cuisine is served at the hotel's restaurant. The hotel's restaurant is open for lunch and dinner. Located just a stone's throw from a range of popular hot spots, the hotel is near a number of bars, nightclubs and fashionable places to eat. The Monastery of Saint Jerome is within a 10 minute walk of the hotel. 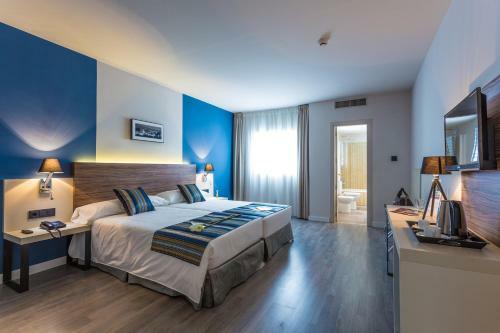 This hotel is 2214 metres from the Alhambra entrance, 1158 metres from Plaza Nueva (the absolute centre of Granada), 1055 metres from the train station and 2735 metres from the bus station.